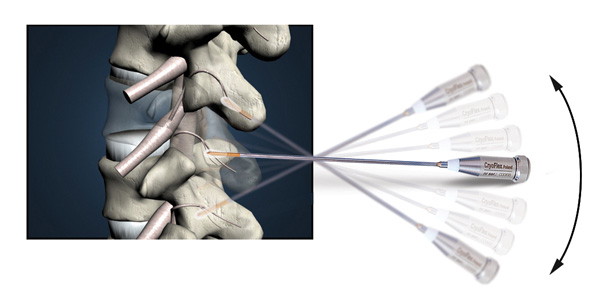 … A state-of-the-art cryosurgical device manufactured by Metrum CyoFlex is the next generation of apparatus used in the surgery field since 1992. 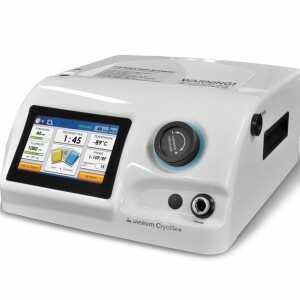 Cryo-S Electric II is controlled by a microprocessor and all pf the parameters are displayed on LCD screen. Mode selection, cleaning of the probe and freezing can be performed automatically using the foot switch or touch screen keeping the site of a procedure under sterile conditions. Electronic communication (chip system) between the main device and the connected cryoprobe. The device will set the ideal working parameters for the connected probe using the built in RF ID Chip and Reader. Pressure and gas flow are set automatically, manual adjustment is not necessary. Contains automatic probe cleaning feature and 3 freezing modes. Temperature of the probe, pressure, gas flow, time of the procedure are displayed during freezing. 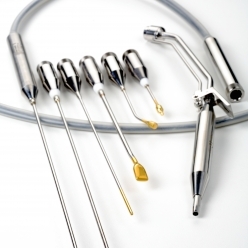 Standard– Cryoprobe is cleaned before each procedure for several seconds and then few seconds of test freezing is performed. In this mode the cryoprobe is tested and prepared according to parameters programmed on attached RF ID chip. When the preparation is complete, the cryoprobe is ready for freezing. Service– Servicing starts automatically when a reduced flow rate in the cryoprobe or blockage is noticed. It can also be performed during the procedure. 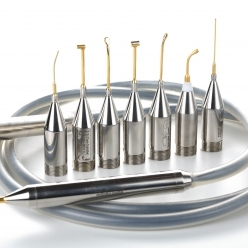 The Service mode is diagnosing and solving problems caused by previous improper use of the cryoprobe, improperly performed sterilization or low quality of gas.